The tree associated with Bhagavan Sri Krishna is the Kadamba Tree (Burflower tree - Anthocephalus Cadamba). As per the Srimad Bhagavad Purana, Sri Krishna climbed on a Kadamba tree after stealing the clothes of gopis. It is also said in the same Purana, that Krishna played his flute sitting on a Kadamba tree. 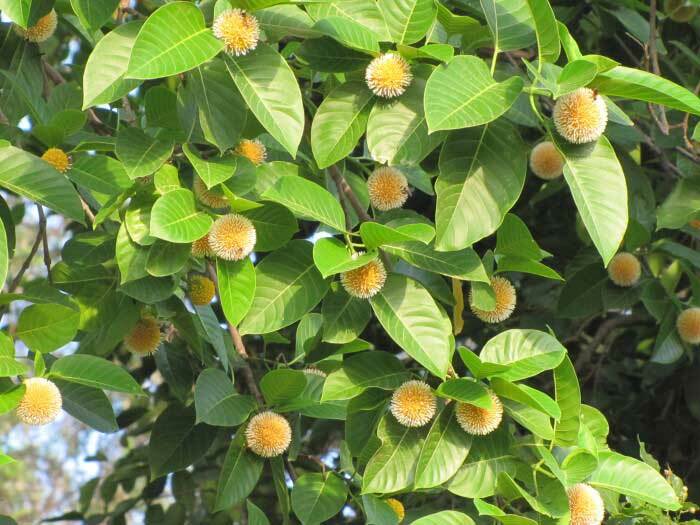 Kadamba tree is also worshipped in Varanasi and other regions in North India. Sri Krishna and Radha used to meet under the Kadamba Tree. Thus the tree is associated with lovers. He used to swing on the branches of tree and used to dance with the Gopis under it. It is believed that Sri Krishna jumped from a Kadamba tree into the Yamuna River to fight the snake Kaliya, who was poisoning the waters of Yamuna. Paste made using Kadamba leaf is applied over wound and swelling. A decoction made from the bark of the tree is used to wash infection related to wood. The same decoction is used for gargling to treat mouth ulcers and inflammation of the gums. Ayurveda uses various parts of the tree to treat fever, cough, gastritis, diarrhea and vaginal diseases. It is also used to improve sperm count and quality.